The MiG-27 ML, codenamed 'Bahadur' in India, has had an impeccable track record in its more than three decades of glorious service to the nation. The MiG-27 ML had proved its worth in various operations, including in Kargil. 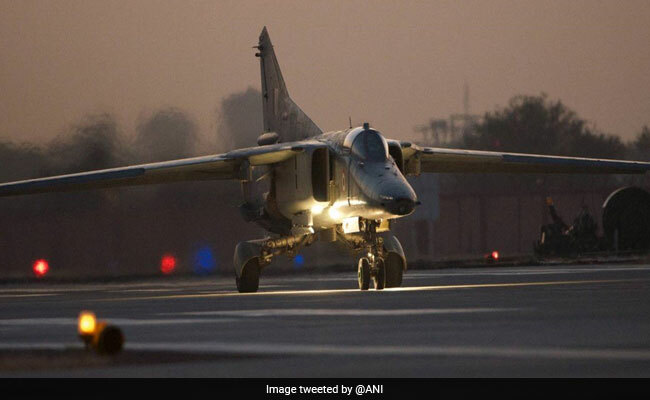 Kolkata: The last MiG-27 ML aircraft roared over Hasimara Air Force base in Bengal on Thursday for the last time as the IAF bade farewell to this legacy fleet in a function, a Defence spokesperson said today. The MiG-27 ML, codenamed 'Bahadur' in India, has had an impeccable track record in its more than three decades of glorious service to the nation, the spokesperson said in a statement. The formidable strike aircraft of Russian origin has the single most powerful engine in the world and variable geometry wing which allows the pilot to change the wing sweep angle while flying as per the mission requirements to achieve optimum flying characteristics, it said. This swing wing fighter bomber was inducted into the IAF fleet in the late 1980s. Being a dedicated ground attack aircraft, it was one of the main strike aircraft of the IAF. With its sophisticated avionics and weapon computers, it is capable of delivering a variety of loads in different modes of attack with immense precision, the statement said. Being a very stable weapon platform with good forward visibility and all around view, it can drop bombs, rockets, precision munitions guided by TV/laser and also fire air-to-air missiles for self defence thus making it a lethal and a potent weapon platform. MiG-27 ML had proved its worth in various operations, including in Kargil and earned rich accolades in numerous international exercises held in India. The pilots proudly call themselves 'Swing Wingers' and have always vouched the aircraft's precise weapon delivery and rapid acceleration, the statement said. Though the last MLs retire, they are not the last swing wing aircraft in service as few of them got a midlife avionics upgrade and continue to serve the nation. They are called MiG-27 UPG and are presently based in Jodhpur. The 22 Squadron, known as 'Swifts' was the last squadron of the IAF flying the MiG-27 MLs. The squadron has a rich history and is known for undertaking the famous 'Boyra Day Operations' in Gnat aircraft, marking the beginning of 1971 War. One of the youngest fighter squadrons, it converted to the MLs in February 1990. The lethal MiG-27 aircraft, with its range, speed and ferocity in attack has always been in perfect harmony with the 'Swift', who bade it farewell with full military honours. Squadron head Group Captain S L Mahajan, who after a stint in Sukhoi-30 MKI, proudly led the last ML. The 'Swift' pilots are slated to move to other squadrons/appointments and the squadron would be number plated for new induction.